The Nexis® LED Candle System by Hollowick, Inc. is the most advanced rechargeable candle system in the world. Nexis® was designed from the ground up with the user in mind. Careful attention paid to function, performance and ergonomics sets this ground breaking commercial lighting system apart from the rest. 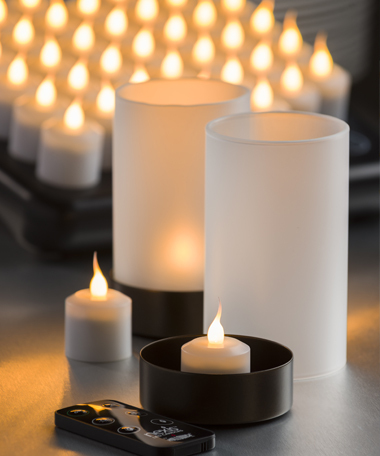 Nexis® Candles turn on automatically when lifted from the charging tray – no buttons required. The authentic Candlelight LED color and natural flicker action, make Nexis® the most realistic looking LED candle available. The Nexis® Magnetic Remote Controls secures conveniently to the top of the charging tray, or to almost any other metal surface. The remote offers four run modes: Flicker, Flicker High Light, Steady and Steady High Light. All Nexis® components are RoHS compliant, meeting the latest, most stringent international material standards. Nexis® is the endorsed by the Green Restaurant Association dinegreen.com. Safeguards built into the power supply, tray and candles make it virtually impossible to overcharge the Nexis® Lithium Ion batteries. Nexis® by Hollowick is the future of flameless table lighting.